Over two thirds of companies have frozen their marketing budgets as the UK is gripped by economic uncertainty. The situation was exacerbated by reduced sales and investment, and a desire to keep costs lean. Nevertheless, despite the vast majority of brands freezing budgets there was still a net increase in budgets after 21% of respondents revealed they increased budgets in Q3, while 11% recorded a cut in budgets during the same period. The net increase of 9.9% was down from a rise of 13.1% in Q2 and is the lowest reading since the first quarter of 2016. Paul Bainsfair, director general of the IPA, said: "What strikes us most is the extent to which UK companies – and their marketing budgets – are caught up in wider economic and geo-political uncertainty. The vast majority are in a seeming state of paralysis." Digital marketing is driving spend where there is growth in budgets, but spend on main media advertising is stagnating as marketers invest in where they perceive to be greater guarantees around cost versus return. Bainsfair has warned against a "sole investment in online at the expense of offline" because, he argues, the most effective approach is having a 60:40 split of brand-building to targeted sales activation. He explained: "A careful balance is required." 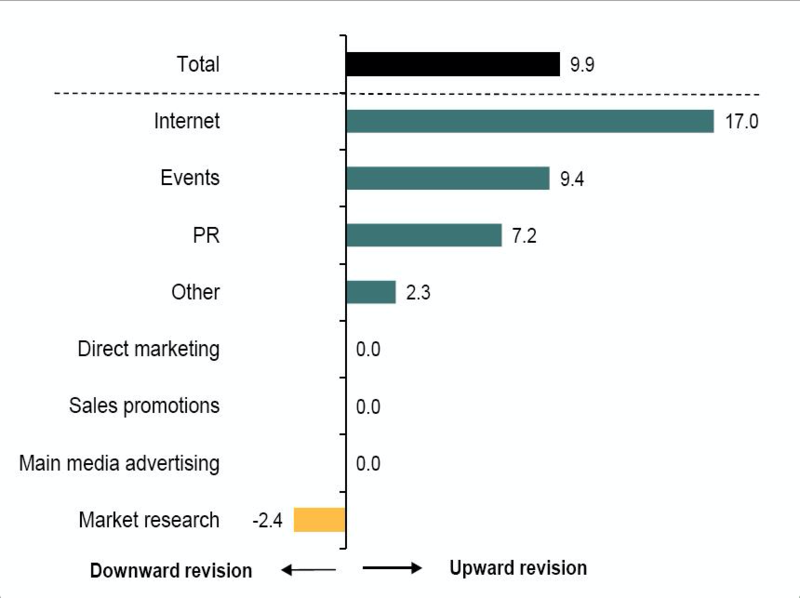 Marketers remain downbeat about the financial prospects of the industry. Some 24% of them are less confident compared to three months ago, while 15% are more optimistic. 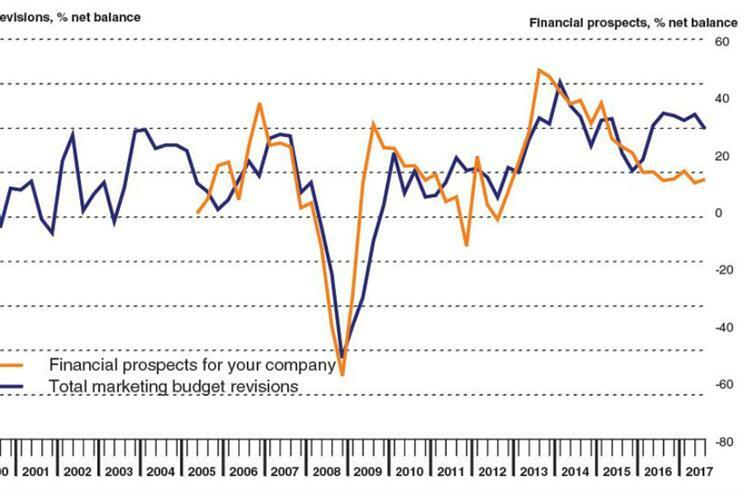 Companies are slightly more optimistic about their own financial prospects. Just over 29% of them grew more confident in the third quarter, compared to 18% that are less optimistic. However, research reveals optimism remains historically subdued and well below the post financial-crisis average. Dr Paul Smith, director at IHS Markit and author of the Bellwether report, said: "Looking ahead, financial prospects remain broadly subdued as concerns about Brexit continue to weigh on sentiment. "Combined with ongoing squeezes on spending from rising costs, these headwinds are likely to continue to undermine growth in the final quarter of 2017." Due to the prevailing sense of uncertainty the Bellwether report predicts only a modest 0.6% increase in adspend for 2017 and a stagnation of adspend in 2018.